Skibbereen in Ireland-South a perfect base for your holiday in County Cork. Find out more about Skibbereen below. 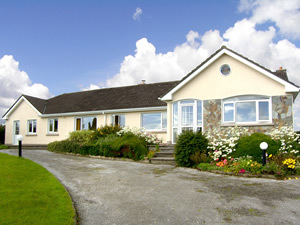 This modern, stylish bungalow is just under 2 miles from Skibbereen. It is a private getaway, located in the countryside, and has its own amazing private garden and lawns with a small wood and stream; at the rear of the property is a spectacular lake view and the good-sized patio space is complete with a bbq. If it is privacy you want, look no further. The luxurious interior of the house has open fires, modern fittings and everything you need to make it a home from home. It has Wi Fi and an Apple TV also. This is the perfect space for a family, or maybe two families holidaying together. There is much in the area to keep you entertained throughout your stay.Shop. Pub. Restaurant 1Ã‚Â½ miles. Beach. Sandy Beach 5 miles. Lakeside 880 yards. GF: lounge/diner, kitchen/diner, utility room with ensuite toilet only, 3 doubles, twin, playroom, 2 bathrooms 1 with separate shower.Electricity and oil central heating included, open fire with starter pack, linen and towels included, No Smoking, flame effect fire, cot, high chair, TV, dvd player, radio, freezer, microwave, washer/dryer, internet access, deck chairs, hairdryer, welcome pack, partially enclosed garden, front and back courtyard, enclosed private courtyard, patio area, bbq, off road parking. Sorry no pets.